"Corneille" redirects here. For other people with the name, see Corneille (name). For two schools in France, see Lycée Corneille. Corneille was born in Rouen, Normandy, France, to Marthe Le Pesant and Pierre Corneille, a distinguished lawyer. His younger brother, Thomas Corneille, also became a noted playwright. He was given a rigorous Jesuit education at the Collège de Bourbon (Lycée Pierre-Corneille since 1873) where acting on the stage was part of the training. At 18 he began to study law but his practical legal endeavors were largely unsuccessful. Corneille’s father secured two magisterial posts for him with the Rouen department of Forests and Rivers. During his time with the department, he wrote his first play. It is unknown exactly when he wrote it, but the play, the comedy Mélite, surfaced when Corneille brought it to a group of traveling actors in 1629. The actors approved of the work and made it part of their repertoire. The play was a success in Paris and Corneille began writing plays on a regular basis. He moved to Paris in the same year and soon became one of the leading playwrights of the French stage. His early comedies, starting with Mélite, depart from the French farce tradition by reflecting the elevated language and manners of fashionable Parisian society. Corneille describes his variety of comedy as "une peinture de la conversation des honnêtes gens" ("a painting of the conversation of the gentry"). His first true tragedy is Médée, produced in 1635. The year 1634 brought more attention to Corneille. He was selected to write verses for the Cardinal Richelieu’s visit to Rouen. The Cardinal took notice of Corneille and selected him to be among Les Cinq Auteurs ("The Five Poets"; also translated as "the society of the five authors"). The others were Guillaume Colletet, Boisrobert, Jean Rotrou, and Claude de L'Estoile. In the years directly following this break with Richelieu, Corneille produced what is considered his finest play. Le Cid (al sayyid in Arabic; roughly translated as "The Lord") is based on the play Mocedades del Cid (1621) by Guillem de Castro. Both plays were based on the legend of Rodrigo Díaz de Vivar (nicknamed "El Cid Campeador"), a military figure in Medieval Spain. The original 1637 edition of the play was subtitled a tragicomedy, acknowledging that it intentionally defies the classical tragedy/comedy distinction. Even though Le Cid was an enormous popular success, it was the subject of a heated argument over the norms of dramatic practice, known as the "Querelle du Cid" or "The Quarrel of Le Cid". Cardinal Richelieu's Académie française acknowledged the play's success, but determined that it was defective, in part because it did not respect the classical unities of time, place, and action (Unity of Time stipulated that all the action in a play must take place within a 24-hour time-frame; Unity of Place, that there must be only one setting for the action; and Unity of Action, that the plot must be centred on a single conflict or problem). The newly formed Académie was a body that asserted state control over cultural activity. Although it usually dealt with efforts to standardize the French language, Richelieu himself ordered an analysis of Le Cid. Accusations of immorality were leveled at the play in the form of a famous pamphlet campaign. These attacks were founded on the classical theory that the theatre was a site of moral instruction. The Académie's recommendations concerning the play are articulated in Jean Chapelain's Sentiments de l'Académie française sur la tragi-comédie du Cid (1638). Even the prominent writer Georges de Scudéry harshly criticized the play in his Observations sur le Cid (1637). The intensity of this "war of pamphlets" was heightened severely by Corneille's boastful poem Excuse À Ariste, in which he rambled and boasted about his talents, while Corneille claimed no other author could be a rival. These poems and pamphlets were made public, one after the other, as once "esteemed" playwrights traded slanderous blows. At one point, Corneille took several shots at criticizing author Jean Mairet's family and lineage. Scudéry, a close friend of Mairet at the time, did not stoop to Corneille's level of "distastefulness", but instead continued to pillory Le Cid and its violations. Scudéry even stated of Le Cid that, "almost all of the beauty which the play contains is plagiarized." This "war of pamphlets" eventually influenced Richelieu to call upon the Académie française to analyze the play. In their final conclusions, the Academy ruled that even though Corneille had attempted to remain loyal to the unity of time, "Le Cid" broke too many of the unities to be a valued piece of work. The controversy, coupled with the Academy's ruling proved too much for Corneille, who decided to return to Rouen. When one of his plays was reviewed unfavorably, Corneille was known to withdraw from public life. He remained publicly silent for some time; privately, however, he was said to be "troubled and obsessed by the issues, making numerous revisions to the play." After a hiatus from the theater, Corneille returned in 1640. The Querelle du Cid caused Corneille to pay closer attention to classical dramatic rules. This was evident in his next plays, which were classical tragedies, Horace (1640, dedicated to Richelieu), Cinna (1643), and Polyeucte (1643). These three plays and Le Cid are collectively known as Corneille's "Classical Tetralogy". Corneille also responded to the criticisms of the Académie by making multiple revisions to Le Cid to make it closer to the conventions of classical tragedy. The 1648, 1660, and 1682 editions were no longer subtitled "tragicomedy", but "tragedy". Corneille’s popularity grew and by the mid 1640s, the first collection of his plays was published. Corneille married Marie de Lampérière in 1641. They had seven children together. In the mid to late 1640s, Corneille produced mostly tragedies, La Mort de Pompée (The Death of Pompey, performed 1644), Rodogune (performed 1645), Théodore (performed 1646), and Héraclius (performed 1647). He also wrote one comedy in this period, Le Menteur (The Liar, 1644). Even though Corneille was prolific after his return to the stage, writing one play a year for the 14 years after 1659, his later plays did not have the same success as those of his earlier career. Other writers were beginning to gain popularity. In 1670 Corneille and Jean Racine, one of his dramatic rivals, were challenged to write plays on the same incident. Each playwright was unaware that the challenge had also been issued to the other. 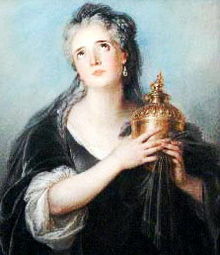 When both plays were completed, it was generally acknowledged that Corneille’s Tite et Bérénice (1671) was inferior to Racine’s play (Bérénice). Molière was also prominent at the time and Corneille even composed the comedy Psyché (1671) in collaboration with him (and Philippe Quinault). Most of the plays that Corneille wrote after his return to the stage were tragedies. They included La Toison d'or [fr] (The Golden Fleece, 1660), Sertorius (1662), Othon (1664), Agésilas (1666), and Attila (1667). He wrote his last piece Suréna in 1674 : it was a complete failure. After this, he retired from the stage for the final time and died at his home in Paris in 1684. His grave in the Église Saint-Roch went without a monument until 1821. The dramatist, author and philosopher Voltaire created, with the support of the Académie française, a twelve-volume annotated set of Corneille's dramatic works, the Commentaires sur Corneille. It was Voltaire's largest ever work of literary criticism. Voltaire's proposal to the Académie described Corneille as doing for the French language what Homer had done for Greek: showing the world that it could be a medium for great art. Voltaire was driven to defend classic French literature in the face of increasingly popular foreign influences such as William Shakespeare. This is reflected in the first edition of the Commentaires, published in 1764, which focused on Corneille's better works and had relatively muted criticisms. By the second edition, published ten years later, Voltaire had come to a more negative assessment of Corneille and a stronger view on the need for objective criticism. He added five hundred critical notes, covering more works and taking a more negative tone. Critics' opinions of Corneille were already highly polarised. Voltaire's intervention polarised the debate further and some critics saw his criticisms as pedantic and driven by envy. In the 19th century, the tide of opinion turned against Voltaire. Napoleon expressed a preference for Corneille over Voltaire, reviving the former's reputation as a dramatist while diminishing the latter's. ^ Corneille and His Times, François M. Guizot; 1852, Harper & Bros., NY; p.130: "His [Corneille's] father was a royal advocate at the marble table in Normandy...."
^ Caplan, Jay (1999). In the King's Wake: Post-Absolutist Culture in France. University of Chicago Press. p. 181. ISBN 9780226093116. ^ a b Williams, David (1976). "The Role of the Foreign Theatre in Voltaire's "Corneille"". The Modern Language Review. 71 (2): 282–293. doi:10.2307/3724782. JSTOR 3724782. Hubert, J. D. Corneille's Performative Metaphors. Charlottesville: Rookwood Press, 1997. Wikimedia Commons has media related to Pierre Corneille.